After some research and trials I created this recipe which is really tasty and buttery, very similar to corn bread and best eaten warm. It goes very well with butter and jam and has a really wonderful flavour and no one will be able to tell it's not wheat! 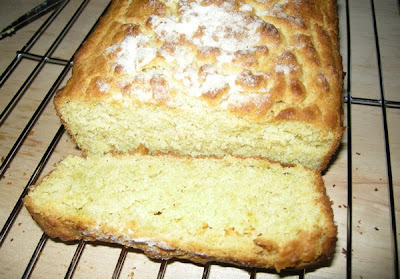 Also this is ideal if you aren't able to eat to eat corn, but miss corn bread! 1. Sieve all the dry ingredients into a large bowl. 2. Cut up the butter into small cubes and add to flour rub into the flour with finger tips until it becomes the consistency of bread crumbs. 4. Make a well in the centre of the flour mixture and pour in the wet ingredients slowly mix together. 5. Tip mixture into a 9" X 5" loaf tin and dust the top with a little white rice flour. Bake for 30-40 minutes until golden brown and a test with a skewer or knife and if it comes out clean it's done. Let cool for 5 minutes and then turn out onto a cooling rack. It can be eaten when still warm and is best eaten within a few days and kept in an air tight container, but can be frozen and eaten later warmed in the oven.